The Gira G1 is a multi-functional room operating device for visualising and operating a variety of building functions. For use in the KNX system and Gira door communication system. Operation is via a gesture-capable multi-touch display. Connection and communication are via LAN or WLAN depending on the version. Integrated microphone with echo compensation. Intuitive user interface that can be adapted by the end user. Switching, dimming, blind and shutter control, value transmitter, scene auxiliary unit. Status display, display of date and time, display of indoor and outdoor temperature. Up to 125 functions (five function folders or rooms with up to 25 functions each). Up to 125 seven-day timer with 10 switching times each. Use as room temperature controller in combination with KNX devices for room temperature measurement, e.g. 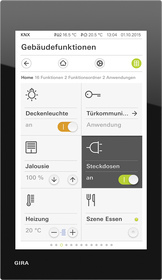 touch sensor 3 Komfort. Use as room temperature controller auxiliary unit in combination with KNX 3 Plus pushbutton sensor for room temperature measurement and control. Operating modes can be adapted individually. Frost or heat protection changeover using window status. Display of room temperature controller information. A heating clock as seven-day timer with 28 switching times. Camera changeover: specific selection of connected colour cameras. Control of the door opener. Switching the ringtone on and off. Ring tone can be selected from a choice of 10 melodies. Adjustment of ring tone and voice volume. Gira weather service: display of the weather forecast for up to five cities (internet connection required). Gira G1 with flush-mounted connection module 230 V WLAN. Recommended mounting height: 150 cm above floor. Installation is performed on a deep device box (an electronics box is recommended for a LAN connection). Communication with the KNX installation is exclusively via the KNXnet/IP standard. A KNX IP router must be used to connect the Gira G1 PoE to the KNX installation. Several Gira G1 units can be operated on one KNX IP router. In order to ensure reliable communication via WLAN, a Gira KNX IP router (firmware version 3 and later) is required to connect the Gira G1 230 V or G1 24 V to the KNX installation. For this purpose the Gira KNX IP router (firmware version 3 and later) is specially equipped with the additional function "Reliable data communication". Several Gira G1 units can be operated on one Gira KNX IP router (firmware version 3 and later). Start-up in the KNX system from ETS 4.2 or higher. Can be used as a home station in connection with the DCS-IP gateway. When planning the system, please observe the technical information on network planning in the device documentation. The Gira Project Assistant (GPA) is required for firmware updates. The GPA is available free of charge in the Gira download area. Using the timers requires either an internet connection to a NTP time server or a KNX clock (e.g. Gira weather station Plus 2074 00). The file from the ZIP folder can be used to trigger a factory reset on the Gira G1 (up to firmware version 1.4.65). Please follow the instructions in the PDF file. To perform the update the Gira Project Assistant V 3.0 is required. Please follow the instructions in the enclosed documentation. With this firmware update the Gira G1 can also be used as a client in systems with a Gira HomeServer. To perform the update the Gira Project Assistant from V 2.3 is required. Please follow the instructions in the enclosed documentation. With this firmware update the Gira G1 can also be used as a client in systems with a Gira X1. To perform the update the Gira Project Assistant from V 3.1 is required. Please follow the instructions in the enclosed documentation.